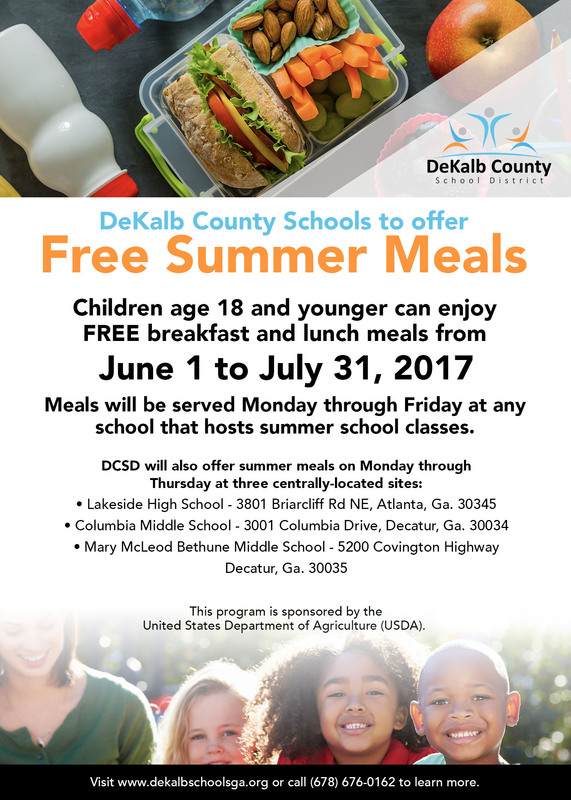 The DeKalb County School District (DCSD) will once again offer free meals during the summer to area students. As part of the district’s Seamless Summer Feeding Program, children age 18 and younger will be able to obtain breakfast and lunch meals from June 1 to July 31. All students may participate regardless of their lunch eligibility status during the school year. Breakfast will be served from 8 to 9 a.m., and lunch will be served from 11:30 to noon, Monday through Friday at any school that hosts summer school classes. Families may visit the DCSD website at www.dekalbschoolsga.org to find the school near their home. The program is sponsored by the United States Department of Agriculture (USDA). For more information on the Seamless Summer Feeding Program, please contact the DCSD Nutrition Office at (678) 676-0162 or visit www.dekalbschoolsga.org.